For thirty years, the Berlin Philharmonic Wind Quintet—an outgrowth of one of the world’s great orchestras, inspired by one of the world’s most heralded conductors—has set the international standard for such ensembles. Established in 1988, the Quintet has been the prolific and peerless voice of their instrumental canon, whether playing Mozart’s compositions for wind quintet and piano alongside Stephen Hough, reinterpreting the music of Leoš Janáček, or taking on new works by the likes of Kalevi Aho. 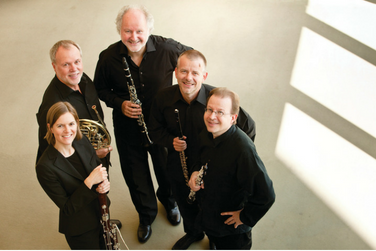 Dubbed “the most polished wind ensemble in existence” by the Boston Classical Review, the Berlin Philharmonic Wind Quintet plays with immaculate clarity and pinpoint precision, each note decisively rendered and each layer thoughtfully contoured. In College Park, the Quintet first takes up the three works that Mozart composed at the end of the eighteenth century for musical automata—those early machines that would play pre-composed pieces themselves. Though historical curios, these numbers are theatric and grand, too, with marches befitting their significance as cutting-edge entertainment. They then turn to the 1929 Wind Quintet, Op. 10 of Czech composer Pavel Haas, a brief but poignant shuffle between mirth and wistfulness. Likewise, despite their brevity, Ligeti’s six Bagatelles for Wind Quintet conjure a world of colors and moods, with the players employing mutes and meticulous phrasing to navigate ever-shifting tones. They conclude with a landmark of the repertoire, Carl Nielsen’s 1922 Wind Quintet, Op. 43, which they recorded as part of a remarkable four-disc box set in 2013. Athletic and sumptuous, inviting but intricate, the work is a showcase not only of the Berlin Philharmonic Wind Quintet’s technical skill but also of their interpretive emotional resonance. This performance is generously sponsored by Richard and Sarah Bourne.